This winter, cosy has totally been my crack. When the temperatures sink and the skies turn grey I thrive in moments (& meals!) that are comforting and calm. All I want is to snuggle (so many fun ways to stay warm;), read, stretch or watch a silly movie (Um, ’Love, Rosie’ had me crying..) and food wise? It’s safe to say that frothy cups of Vedic Golden Milk are frequent and the mere thought of crazy healthy super crisp and fresh green salads almost makes me cringe. Speaking of cosy, a couple of days back, an early morning when I had just made our daybed in the livingroom (where I sleep most nights because If I’m in the same room as Caspian he wakes up all.the.time) that particular prince start throwing away all the pillows I had just put there and crawls under the linen covers. First I’m like ’Oh crap..’ and then I got curious, what was he up to? After a couple of seconds I hear his tiny voice call ”Mor! Mysigt!” (Mum! Cosy!) and I just turn into a puddle of love. Bah! It’s funny how the lack of sleep/showers/tooth brushing/space/date nights etc can be forgotten in the blink of an eye. It is amazing to watch Caspian grow and explore and it’s nothing but miraculous to be there beside him, giving him space to be all that he is and also never-ending comfort when that’s needed (me complete with dirty hair and a hungry belly). He has discovered that it can be cosy to snuggle in my lap for a while (5 seconds) or read a book on the daybed and apparently now he even says ”cosy”. Well let’s just say that anything my brain occupied itself with melted away quite fast. 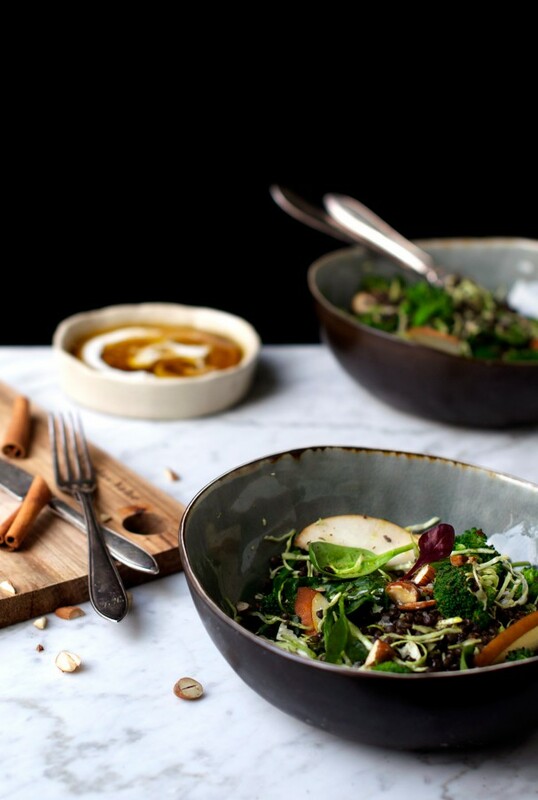 Living in scandinavia during wintertime leaves me longing for steamy soups, gratins and ratatouille-like creations and even though you can totally sneak in a good amount of greens in those there are some ways to winter-ify a good ol’ bowl of salad. Essentially, you want the salad to be comforting, creamy, slightly sweet (which can be retained by sweet spices) and oh-so satisfying. Here are some ways that will get you hot for salads (yup, even if it is February). Texture is the most important thing here. Your salad should not be too dry or crisp but rather smooth, creamy and with a sort of melt-in-your-mouth feel to it. Using roasted root vegetables or steamed veggies is a good way to retain this and will also help make the salad warm and comforting. Sweetness is a great part of a winter salad and I’m not saying you should pour half a cup of maple syrup over your bowl. 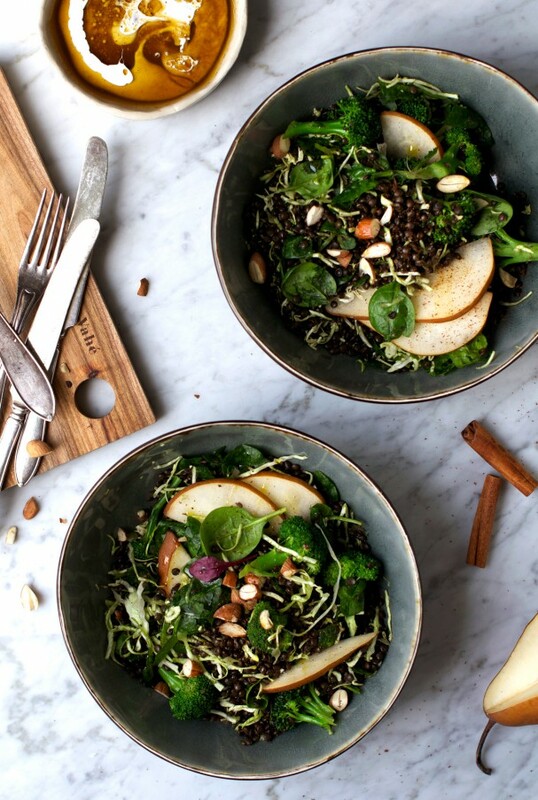 Ginger, Cardamom, Cinnamon, Sesame oil or just a few pieces of warmed seasonal fruits are some great ways that will make your salad hit that sweet spot. Nuts/Seeds are amazing for these kinds of green winter bowls. Either in the form of nut butter, plain roasted or ground into a delicious spice blend/streusel such as Dukkah. Spices are a quick way to get that steam going so don’t be shy. For this specific salad I used freshly ground cinnamon (yes it’s a thing! I mean check out this gorgeous grater) allspice, ginger and bay leaf (not a spice per se) which all help our body to generate and simulate warmth (so called yang tonics). Dressings are essential for any salad weather it’s wintertime or high summer. 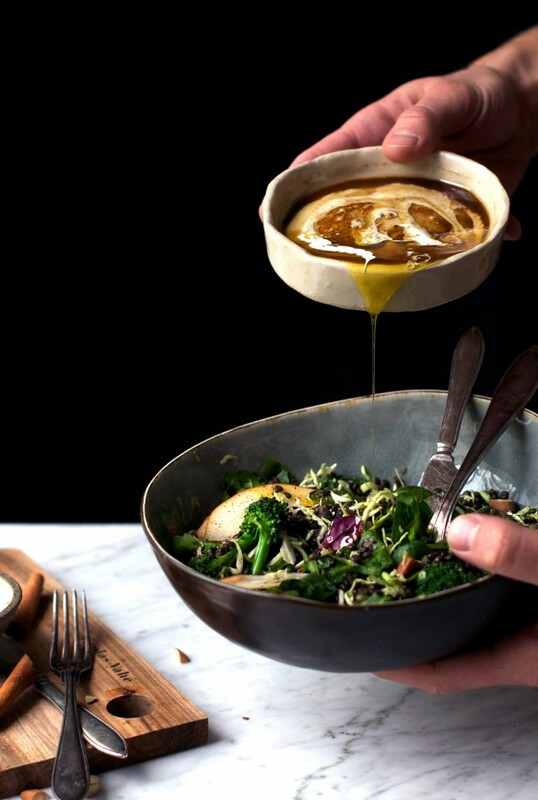 In the summertime you might go for a tangy and fresh oil-free splash but during this cold season it’s better to opt for something creamy that can find it’s way into all the nooks and parts of your salad components. Components of a warm winter salad could be roasted or lightly steamed root vegetables, winter squash/pumpkin, broccoli, cauliflower, sturdier greens like kale or bok choi are also great to steam or sauteé and caramelized onions are always a good addition. If using raw greens you want to slice them very thinly and/or give them a quick massage (like I’ve done with the cabbage and spinach below). Cooked grains and legumes are also a super yummy part of a winter wonder salad. You might want to check out my GF Grain Guide over HERE for some suggestions and then you are good to go! 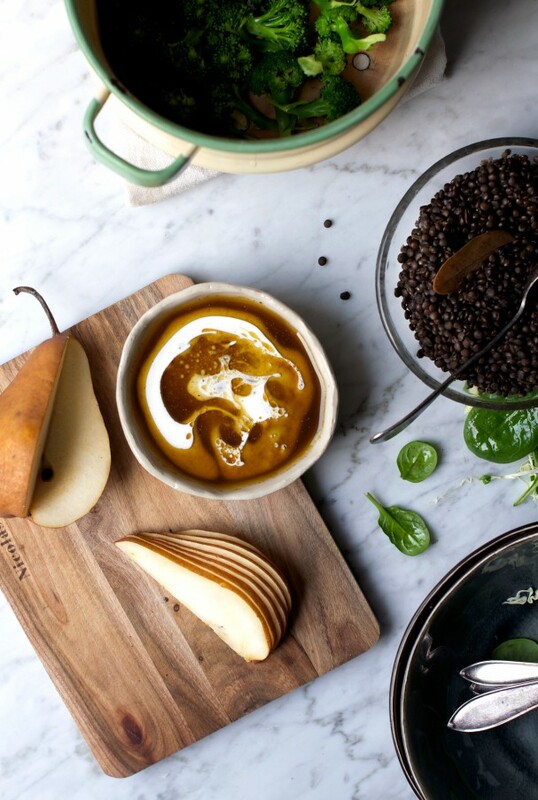 Preferably soak lentils in water for 12-24 hours (but you don’t have to). Rinse lentils and add to a saucepan along with the 2 cups fresh water, bay leaves, allspice and rosemary. Bring to a boil then reduce to medium heat and let simmer for 7-15 minutes or until cooked but absolutely not mushy. Cooking time vary depending on if or how long you’ve pre-soaked lentils for. Once you feel like lentils are cooked but there’s still some water left simply discard of the water. 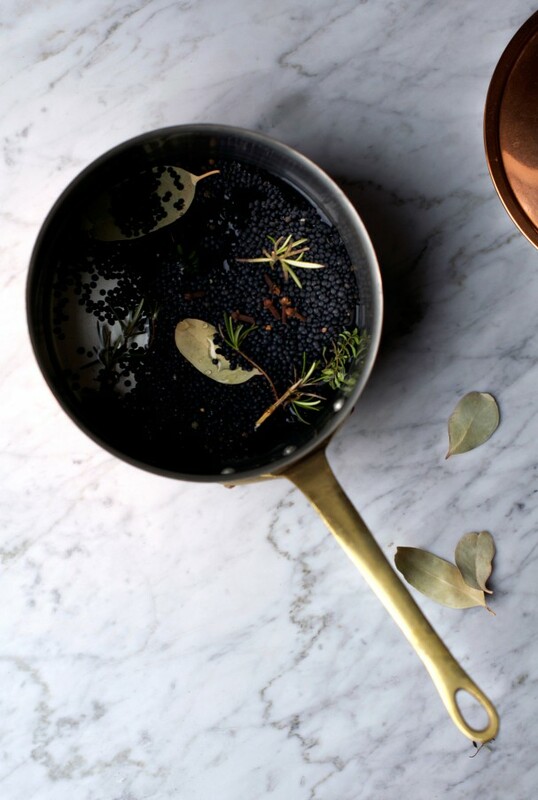 Remove rosemary twigs, allspice and bay leaves and set aside. 1. Rinse and break off broccoli florets and cook in a steaming basket over boiling water (or over the lentils when cooking) for no more then 2-3 minutes. The broccoli should still have some crunch to them (important!) or you will have lost all of the chlorophyll and be left with mushy watery greens. Remove from heat source but keep in steaming basket and set aside. 2. Thinly slice spring cabbage using a mandolin slicer to get it super thin and add to a mixing bowl along with the spinach. Give cabbage and spinach a quick massage with your hands until slightly wilted. 3. Slice pear thinly and set aside. Add the steamed broccoli to the saucepan of cooked lentils and pour over the dressing. Stir until well-combined then add the cabbage and spinach and give it all a quick toss. Plate salad and add a few slices of pear to each one. Grate some fresh cinnamon on top of it all for that final (and wildly delicious) touch. You may be able to use your regular grater if it’s a really good one but there are graters available that are specifically designed to grate sticks of cinnamon. I know, it’s super nerdy but believe me when I say that the taste and smell will be like nothing else you’ve ever tried. Let us know how you’re keeping warm and cosy in the comments below (the things you can tell here:) and we’ll share good wintery food ideas with each other! Ps. The GIVEAWAY for Amy Chaplins ’At Home In the Whole Foods Kitchen’ is still running in my last post so hop on over HERE for a chance to get your hands on THE most amazing cookbook.